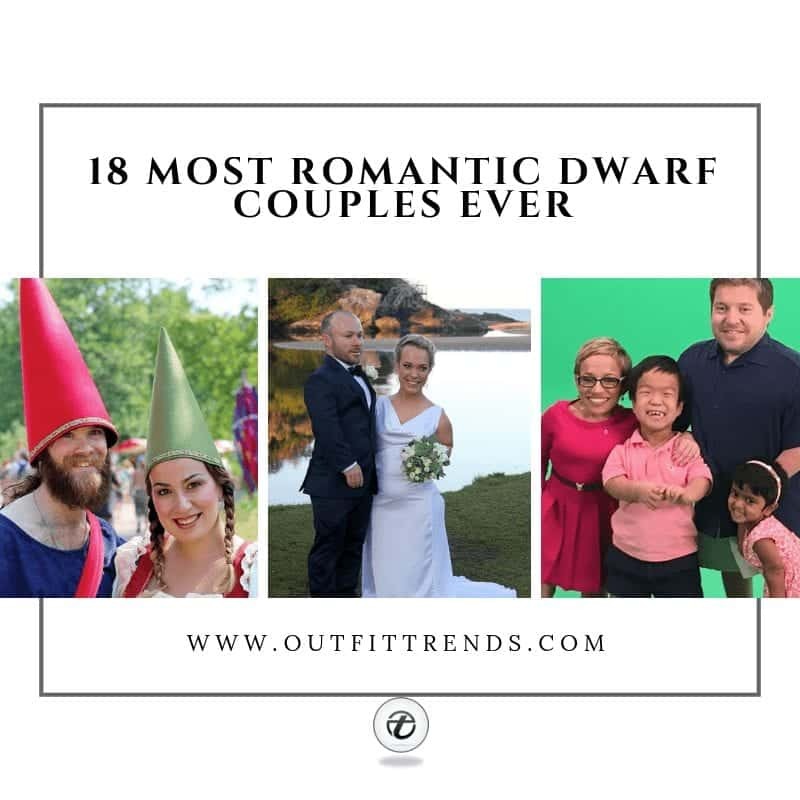 Cute Dwarf Couples: Ever heard of the saying, “Good things come in small packages”? Well, we are here to tell you why it is true. Meet these Dwarf Couples that are here to melt your hearts. They may be ‘Little People’ to the world but to each other, they are their everything. Sticking together like every normal couple, these dwarfs fight all odds to make their relationship work. The fact that a short height does not bother these people makes us realize how thankless we are to not count our blessings. Moreover, it is a lesson for people that there is no need to look for love elsewhere when there is so much love within. Before we talk about these adorable people, here is something we would like you to know. Being overweight, underweight, short or tall is something that is beyond one’s control. Try to accept yourself the way you are. Respect people and love them for who they are instead of trying to be the way you want them to be. Loving your ownself transforms your aura and the way people perceive you. Stop finding flaws within yourself or others and let loose. Peter Dinklage, who plays Tyrion Lannister in Game of Thrones, is one of Hollywood’s most famous Dwarfs. The actor suffers from achondroplasia, a common cause of dwarfism. He married a Theatre Director named Erica Schmidt in 2005. Schmidt happens to be 5 Ft and 6 inches tall yet accepts her, 4 Ft 4 inches, tall husband with love. The couple has two babies but are extremely private and do not disclose much about them. The actor has won a Golden Globe and is often spotted with his wife at Public Events. Here are Celebrity Couples Who Nailed It In Matching Outfits. With a history of a rare genetic disease, Warwick entered the Entertainment Industry and made it his home. The Harry Potter fame star and his lovely wife have been married since 1991. Daughter of Warwick’s Business Partner, he met Samantha while filming Willow, where she had a small role. Like Warwick, Samantha is also a dwarf as she suffers from achondroplasia. After losing 2 sons and an additional 2 miscarriages, the couple was able to welcome their two little ones, Annabelle and Harrison. Danny Woodburn, who is better known as Mickey Abbott of Sienfield, is a Hollywood Actor, Comedian, and an Activist. Woodburn is married to Amy Buchwald, trained in theatre arts. The talented couple is also known to have created a menopausal superhero. The couple is known to stand for what they believe in and do not shy away from talking about topics that are considered taboo. Buchwald is an individual of a fairly normal height, unlike Woodburn who is a dwarf, yet the two have been in love since 1998. The story of Tony Cox and Otelia Cox is no less than a fairytale. The couple started the cliched way by being high school lovers and Otelia also got to be Tony’s prom date. He then proposed to her after graduating and got married in 1981. They have since been together and have a child of their own. Despite having a public life, they have managed to keep the name and gender of their child under the wraps. The couple also does not make public appearances together, keeping their love life private. Here are 18 Cute Matching Outfits For Black Couples. The most common cause of Dwarfism seems to be Achondroplasia, a disease that Brad Williams was also born with. The disease reflects greatly in his form of work. His career began with a Live Comedy Show featuring Carlos Mencia which he attended as an audience. Impressed with his humor, Mencia chose William for the show’s opening acts that he has done ever since. Brad and Jasmine tied the knot in September, last year. The couple has been successful in keeping their love life private and it is not known how the two met. The famous Hollywood actor, Jerry Maren played Munchkin in the 1939 film, The Wizard of Oz. At the age of 18, Maren was 3 Feet and 6 Inches tall. He later got a hormone treatment that allowed him to grow to Four Feet and Six Inches. Jerry was married to Elizabeth from 1975 till 2011, the year she breathed her last. Elizabeth is known to have always been by her husband’s side and loved listening to his stories. Interestingly, the two had initially met at the Little People of America Meeting. Before her marriage, she had been a data processor and switched fields post marriage. She worked as an actress but garnered most appreciation as a stunt double. Jerry Maren died 7 years after the death of Elizabeth. The story of Nathan and Laura is a fairytale in its true essence. The two met while playing dwarfs for a Snow White theatre play. After their engagement in 2013, they welcomed their little baby boy, Nathan Jr, in 2014. The baby is also known as a miracle child as he suffers from two forms of Dwarfism. The parents had been warned by the doctor about his low chances of survival. Yet when Nathan and Laura recently tied the knot, Nathan Jr. was the ring bearer. With the cushion a tad bit heavy for him, he threw it away and still managed to be the center of everyone’s attention. Joe and Leah are the perfect definitions of strength. Leah, 37, has a Masters in Public Policy, while Joe, 36, has a Ph.D. in Philosophy. Both of them suffer from different forms of Dwarfism but do not let that define them. The birth of their little daughter, Hazel, brought with it a surprise that she was average-sized, unlike her parents. After Hazel came Silas, their baby boy, who is also average-sized. The couple strongly advocates the rights of the disabled and do not shy from using the term dwarfism. Joe’s sense of humor and wit and Leah’s lively nature make for a perfect combination. The couple documented their struggle to conceive and their day to day adventures in the movie Far From The Tree. The Instagram-Famous couple Cullen and Charli are happily married with two kids. The two suffer from different kinds of Dwarfism, with Charli being a sufferer of achondroplasia and Cullen of geleophysic dysplasia. Cullen has had the life-changing opportunity of working with Chris Hemsworth, while Charli uses Instagram as a platform to share daily life updates of her family. The much in love couple go about their lives like any ordinary couple and live life to the fullest. Both their babies suffer from a similar kind of dwarfism and the Adam Family remains steadfast in bringing up their children desensitized to it, ensuring normal lives for them. Here are 50 Cutest and Romantic Indian Couples. Brazilian Actor-Model, Karina Lamos is known as World’s sexiest dwarf who has set social media on fire with her good looks. The 4 Feet, 3 Inches tall beauty has 170,000 Followers on her Instagram. The actress is full of confidence about herself and loves staying in shape. She has often been spotted with her lover on Instagram where she does not shy away from indulging in some PDA. Karina’s partner seems to be slightly taller than her and we love how adorable they look together. Bill Klein happens to be a businessman, while Jennifer is a Neo-natalist. The couple got together for a television series ‘The Little Couple’ that aired on TMZ. Both of them suffer from skeletal dysplasia which leaves Bill at a height of 4 feet, while Dr. Jennifer is about 3 Feet and 2 Inches tall. The couple has endured extremely tough times together. Starting with their struggles with conceiving which eventually lead to the adoption of two lovely children, Will from China and Zoey from India, both of who are dwarfs. Jennifer then revealed suffering from a rare form of cancer that was a result of a Non-Viable Cancer. Jennifer loves to document her life and parenting struggles on her Instagram page. Here’s a very interesting story where Paulo and Katyucia met over social media. The two hold Guinness World Record for being the shortest married couple. Paulo serves as a legal secretary while Katyucia is a beautician. The couple marked their union with a cake, wedding attire and a fun photo-shoot. The couple was also presented with a certificate amidst the celebrations. The lovely couple has been together for over 8-years now. James, 3 Feet 4 Inches tall used a specially made ladder to say his vows to his 5 Feet 7 Inches tall Bride. The couple got engaged in 2014 and married 2 years later. James was born with Diastrophic Dysplasia as his parents carried the rare gene. However, this did not bother his loving wife who married him without any uneasiness. The couple once met over lunch where James was presented with Crayons as he was mistaken for a child. Average sized Jenna Howard found her love in a 4 Feet 3 Inch tall Steve. Jenna does not mind the size difference and considers Steve to be just as handsome as Brad Pitt. The couple has a set of 3-Year-old twins where the little girl suffers from a form of dwarfism while the little boy is growing at an average rate. The couple met through a friend and 4 months in, she got pregnant, after which there was no looking back. Do check out these 150 Romantic Muslim Couples Islamic Wedding Pictures. The President of Dwarfs Sports Association UK, Arthur, and Chair, Penny, were awarded an OBE each in June 2014 by the Queen. Arthur and Penny, who are grandparents to two, are dedicated to working for the Dwarf Community. What is more romantic than being steadfast and hardworking towards a common cause that is relatable to both? Arthur and Penny share the same form of dwarfism and struggled with conceiving children of their own. The couple adopted a baby boy after which they were able to conceive a baby boy who, sadly, could not survive. The couple later adopted another child with dwarfism. Penny has since spoken up on dwarfism, spreading awareness in the field of medicine. The lovely couple from China is just like any ordinary couple. They belong to Luoyang, Henan province of China and sweetly pose for their wedding pictures. We love how happy they look together. Gillian is a primary school teacher from Lancashire and suffers from achondroplasia. Gillian along with husband Steve, who, by the way, is of average height, starred in an ITV Documentary titled My Dwarf Family. Gillian and Steve are parents to Sophie, who is also a sufferer of dwarfism. Through My Dwarf Family, she documents how her life is nothing different from ours. She also disapproves comedy targetted towards individuals of short height and wants people to treat dwarfs as grown-up people and not children. The only actor she approves of is Peter Dinklage. We find it sweet how Gillian’s height never seemed to be a problem for Steve who loves her for she is. One of the most heartwarming couples – Nicole and Mike, the two met at a mutual friend’s wedding. Nicole is a woman of average height, while Mike suffers from Achondroplasia. 27 weeks into her pregnancy, Nichole found out her son also had Achondroplasia like his dad. Right after the birth of their son Vincent, he had to be taken to the NICU after minor complications but it all turned out well. Nicole even blogged to talk about her pregnancy and her struggles of raising a son with Achondroplasia up until Vincent turned 10 months old. The greater message to take away here is how in love these beautiful people are with their partners regardless of height, weight, cast or creed. It is essential to love people as they are instead of who you would want them to be.